Israeli bulldozers on Tuesday morning knocked down a Palestinian commercial facility north of Occupied Jerusalem. The building owner, Osama Badr, said Israeli police forces and border guards, escorted by heavily-equipped bulldozers, cordoned off his auto wash, located in Beit Hanina, before they proceeded with the demolition. Badr added that the demolition was carried out under the pretext of unlicensed construction, in the third such move executed over recent months. “The car wash is the only source of income for my family and children,” said the owner. On Monday, Israeli civil defense crews stormed Khan al-Ahmer Bedouin community, east of Occupied Jerusalem, and notified the demolition of a number of Palestinian homes and civilian facilities. A Palestinian building was razed to the ground in al-Za’im village, east of Occupied Jerusalem, while another, located in the lower floor, sustained heavy material damage as a result of the arbitrary demolition. 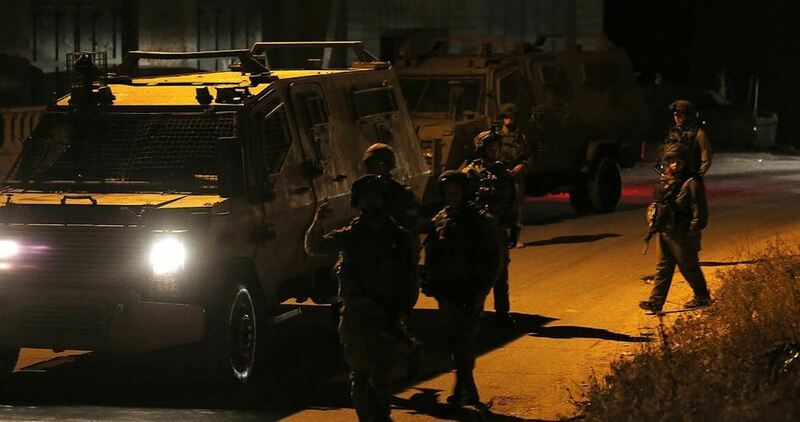 Several Palestinians were kidnapped by the Israeli occupation forces (IOF) at daybreak Tuesday in abduction sweeps rocking West Bank provinces. The IOF claimed responsibility for the abduction of 16 Palestinians from the West Bank over the past few hours. 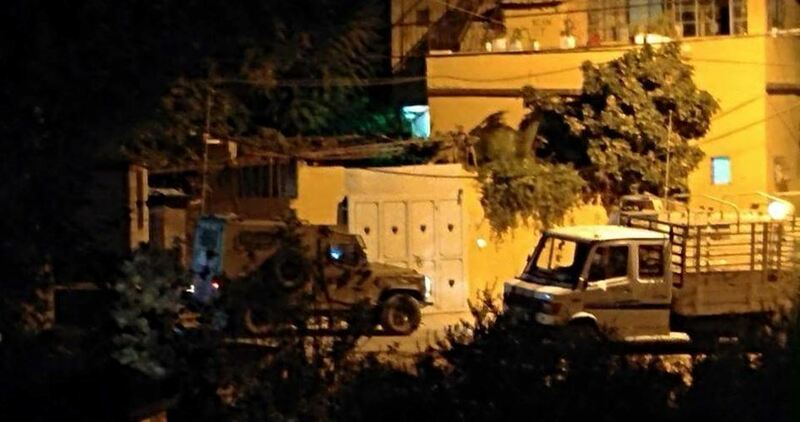 The occupation forces broke into the home of ex-prisoner Sofian Jamjoum, south of al-Khalil, and subjected the family members to intensive questioning, before they seized his wife’s car. Two Palestinians were kidnapped by the IOF from al-Khalil while another was summoned to questioning. The Israeli soldiers also stormed Kafl Haris, north of Salfit, and ravaged Palestinian homes, before they kidnapped two boys, in their 17s, from their family homes. The IOF kidnapped two more Palestinians from Qalqilya and ordered a father to turn his son in. Palestinian young man Haytham Salahat was kidnapped by the IOF from his home in Nablus province. At the same time, a number of Palestinian civilians sustained injuries shortly after the IOF troops stormed Tulkarem and attacked anti-occupation protesters with teargas canisters and sound bombs. A set of makeshift checkpoints was also pitched by the occupation soldiers north of Tulkarem. The Israeli occupation army on Monday evening released two Palestinian fishermen after its naval forces kidnapped them earlier on the same day from their boat off the northern coast of the Gaza Strip. Local sources said that the fishermen, Amr and Mohamed al-Sultan, arrived in Gaza through the Beit Hanoun (Erez) border crossing in northern Gaza after the Israeli navy detained them for several hours. They added that the Israeli navy confiscated their fishing gear and refused to give it back to them. Palestinian fishermen are deprived of working freely off the coast of Gaza, especially in its northern waters, and exposed to frequent assaults and arrests by the Israeli navy. Israeli authorities on Monday notified the demolition of a number of Palestinian houses in the Bedouin village of Khan al-Ahmar in Occupied Jerusalem for allegedly being unlicensed, local sources reported. Israeli authorities constantly harass the residents of Khan al-Ahmar in order to seize their lands for the benefit of implementing a number settlement projects in the area, most notably project E1 which is aimed at separating the village from Jerusalem completely. In another context, Israeli police broke into al-Isawiya town in Jerusalem, raided the house of the Palestinian youth Mohammed Obaid and wreaked havoc on it. Clashes where witnessed between Palestinian citizens and the Israeli police during and after the raid. 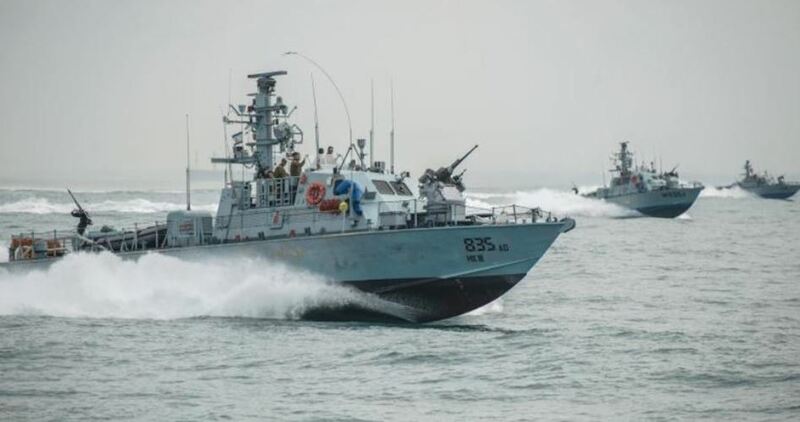 The Israeli navy on Monday morning kidnapped two Palestinian fishermen and confiscated the boat they were aboard off the northwestern shore of Gaza City. 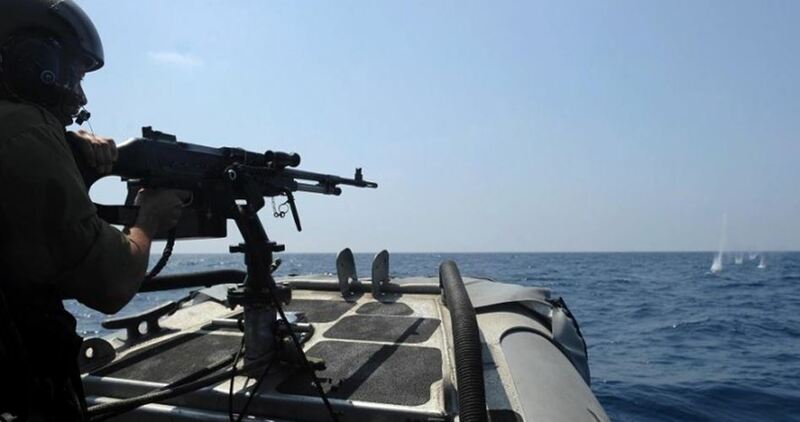 Local sources told WAFA news agency that Israeli gunboats started to open machinegun fire around fishing boats as they were working within four nautical miles off the coast of al-Sudaniya area to the north of Gaza City. They added that Israeli navy soldiers rounded up two men aboard one of the fishing boats and then towed it to the nearby Israeli port of Ashdod. The identities of the two detained fishermen are still unknown. Israeli gunboats are around Gaza fishermen almost every day, harassing them, shooting at them, damaging their boats, and making arrests. Sometimes fishermen are killed or injured during gunfire attacks. Under the 1993 Oslo accords, Palestinian fishermen are permitted to fish up to 20 nautical miles off the coast of Gaza. Over the past 18 years, however, Israel has reduced the fishing area gradually to a limit of three nautical miles as part of its blockade on Gaza. 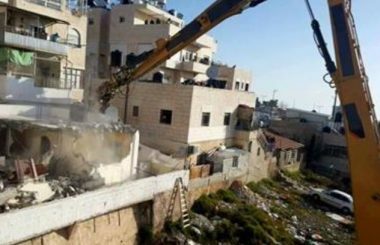 Israeli soldiers invaded, on Monday morning, the village of al-Za’im, in occupied East Jerusalem, and demolished a Palestinian residential building. The soldiers surrounded the village before many army jeeps, and military bulldozers, invaded it, and demolished the building, owned by Mohammad Awad Sa’iri. The Israeli army claims that the building was constructed without obtaining a permit from Jerusalem City Council. Under the Oslo agreements between Israel and the Palestine Liberation Organization (PLO), and the subsequent creation of the Palestinian Authority, the village was designated as part of “Area B” in the West Bank, therefore, construction permits are issued by the local council, which is run by the Palestinian Ministry of Local Government, and not by Jerusalem Municipality. Minister of Jerusalem affairs Adnan al-Husseini has accused the Israeli occupation authority (IOA) of seeking to isolate al-Walaja village from its surrounding Palestinian areas, especially Occupied Jerusalem. In press remarks on Saturday, Husseini said there is an Israeli plan targeting al-Walaja village, south of Jerusalem, through dismembering it and turning it into isolated cantons. He said that the IOA is working on closing the village from all sides and restricting the entry and exit of residents through a military roadblock near the settlement of Har Gilo. He warned that Israel’s persistence in its settlement expansion activities in the occupied territories and its ethnic cleansing practices against the Palestinians would close any window for the establishment of an independent Palestinian state. 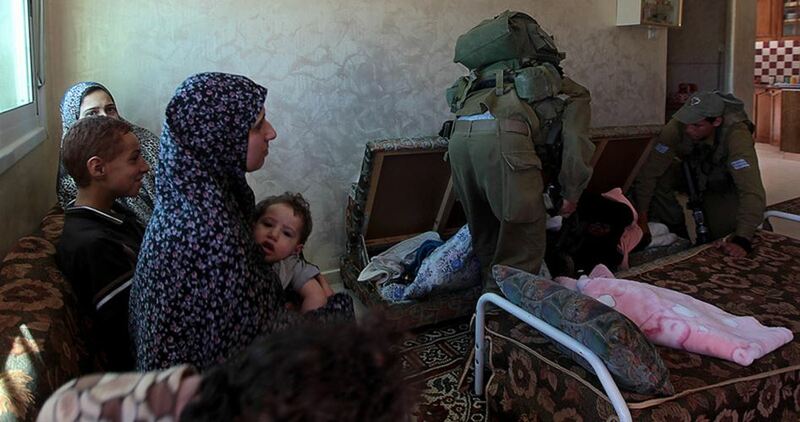 The Israeli occupation forces (IOF) at dawn Sunday carried out raids on homes and arrests in different West Bank areas, where they also engaged in clashes with local young men. According to a statement released by the Israeli army, its forces arrested eight wanted Palestinians accused of being involved in activities and attacks against Israelis. Local sources reported that the IOF stormed Beit Ummar town in al-Khalil and kidnapped two Palestinian young men from their homes. They were identified as Ahmed Abu Ayyash and Khattab Abu Mariya. 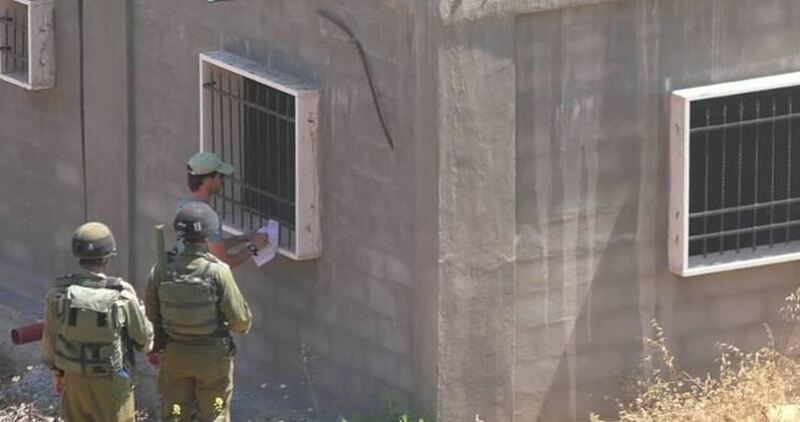 The IOF also raided homes in Asida and Khillat al-Ein areas of Beit Ummar town and handed a citizen called Ibrahim Sabarneh, 47, a summons for interrogation from the Shin Bet in the military outpost of Etzion. In Jerusalem, the Israeli police rearrested a Palestinian woman named Hinadi Halawani after breaking into and ransacking her house at dawn. In Qalqilya, Israeli troops kidnapped a young man following a violent raid on his home in Kafr Saba neighborhood. He was identified as Abdul-Fattah Maskawi. Another young man from the same area was also handed a summons for interrogation from the Shin Bet before clashes broke out between local youths and soldiers. Eyewitnesses said that a young man suffered a rubber bullet injury during the confrontations with the soldiers in Kafr Saba. Three other young men were also rounded up by soldiers today, one from his home in al-Dawha town in Bethlehem and two at the military checkpoint of Shuafat in northern Jerusalem. Earlier, Israeli soldiers intercepted a young man riding a motorcycle at a makeshift checkpoint on the Haddad road, east of Jenin city, detained him for several hours and confiscated his bike before letting him go. Eyewitnesses reported that the soldiers at the same checkpoint arrested another young man they identified as Ahmed Khalifa and took him to an undeclared place. 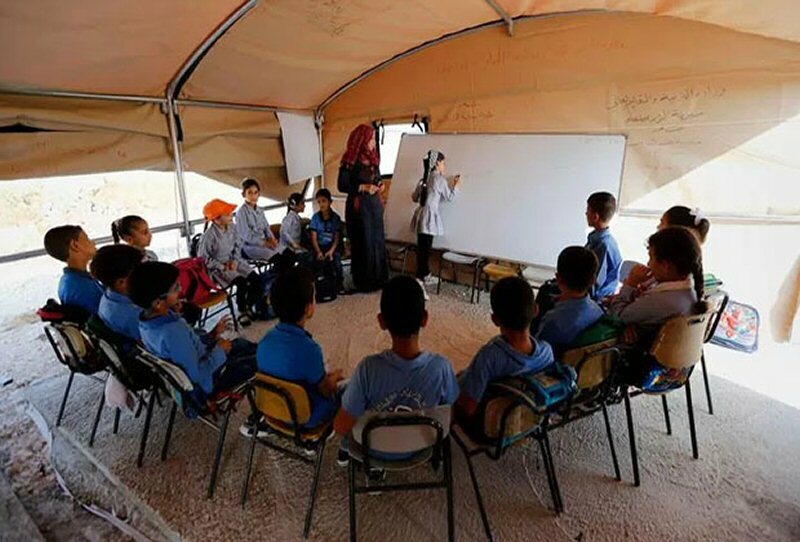 Israeli demolition of a European-financed school in the occupied West Bank has forced Palestinian children to instead attend classes in a tent. Palestinian activists restored some good cheer to primary school students in Jub al-Thib as they set about rebuilding their school, over the night of September 9-10, using concrete blocks. On August 22, Israeli authorities had demolished the only school in this West Bank village, located east of Bethlehem, a day before the start of the new school year. 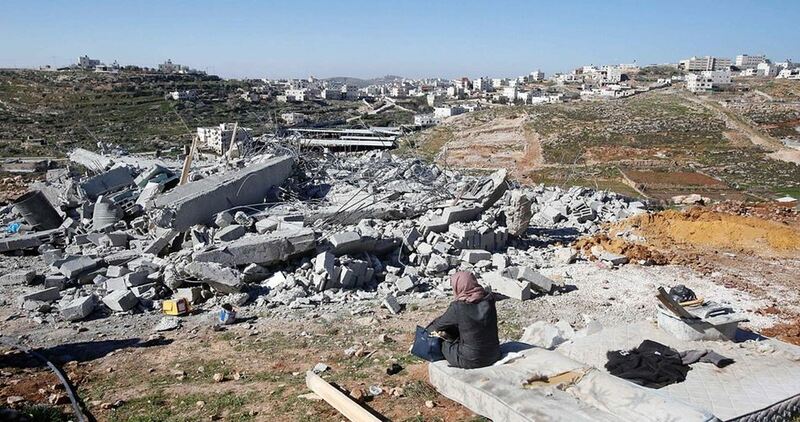 The Israeli occupation has banned practically all construction by Palestinians in Area C, where Jub al-Thib is located, denying them permits to do so and prohibiting the use of concrete. It destroyed the school building on the grounds of being constructed without a permit. Area C is completely controlled by Israel, as set out in the Oslo Accords signed in 1993. The demolition left some of the 64 students in grades one through four in tears. The children had previously attended classes in warehouses and had been looking forward to a new school building. The residents of Jub al-Thib worked for months to build the since-destroyed school, the first to be erected in their village. The European Union provided financial support for the project, and construction proceeded under the supervision of the Palestinian Authority’s ministry of education and higher education. In an August 23 statement, the Norwegian Refugee Council said: “Right now, some 55 schools in the West Bank are threatened with demolition and ‘stop-work’ orders by Israeli authorities.” Shadi Othman, EU spokesperson in Palestine, said that 20 of the schools are EU-funded, and four, including Jub al-Thib, have been destroyed. Israel’s prohibition on construction, threats of demolition and stop-work orders all stand to negatively affect Palestinian students’ ability to obtain an education. Given the lack of resources available, West Bank municipal councils, anti-settlement committees and other local organisations and prominent figures in Area C work in cooperation with foreign donors in efforts to counter such actions and find alternatives and solutions. In the case of Jub al-Thib, for instance, to get around the prohibition on concrete, residents had seized on teaching students in warehouses before the proper school building, which had a steel frame, could be erected. After Israel demolished the school, tents were erected on the site so students could continue to attend classes. 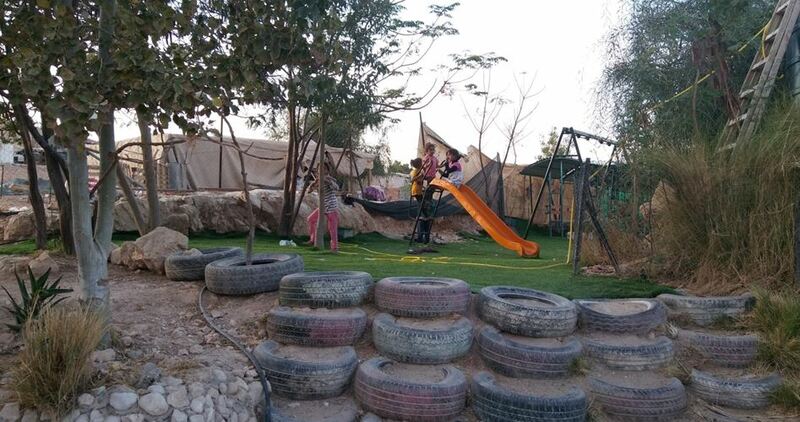 In the Bedouin village of Khan al-Ahmar, in East Jerusalem, 170 students are studying in a school that was built out of tires and mud in 2009 after Israel banned construction with cement. They were inspired by such buildings in poor and marginalized areas elsewhere in the world, such as in parts of Colombia. Khodor added: “The government does not apply to these schools the same standards that apply to other schools. We give priority to filling all their needs irrespective of the cost. Sometimes we even assign one teacher [when there are only] two or three students, as is the case in the Arab Kaabneh Bedouin elementary school in Jericho.” The government hopes that by showing flexibility, it will encourage other communities to open educational facilities regardless of the number of students and type of facility. Stressing the importance of finding alternatives for demolished schools, Khodor emphasized that his ministry is determined to prevent demolition orders from cutting short the educational process. He explained that when a school receives a demolition notice or a construction moratorium, legal follow-up is provided through a ministerial defence committee and contacts with international bodies to pressure Israel into withdrawing the order. Typically, the courts might postpone a demolition order, but not cancel it. Although not ideal, the classroom work-arounds so far developed are better than having no schools at all. For the students and their families, the schools are one more means to fight Israeli attempts to force them off of their land. 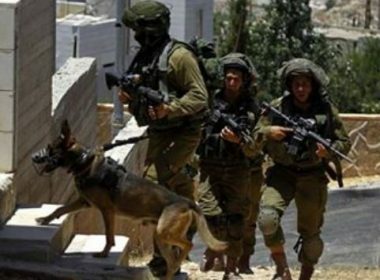 The Israeli Occupation Forces (IOF) on Friday evening broke into Samua town south of the southern West Bank province of al-Khalil. A local house was violently stormed during the raid. The house's owner Sami Abu Yaqub affirmed that IOF soldiers broke into and searched his house before arresting his two sons aged 19 and 22. Abu Yaqub pointed out that a large sum of cash estimated at 20,000 shekels and jewelry had been stolen by the IOF soldiers during the raid. A horde of Jewish settlers on Thursday evening sabotaged a Palestinian olive grove in Kafr Qalil town, south of Nablus in the occupied West Bank. 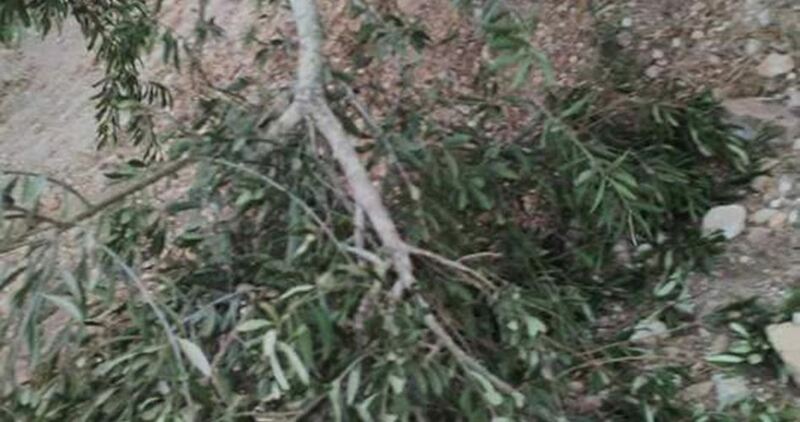 A local resident reported that settlers from the illegal settlement of Har Brakha destroyed fruitful olive trees belonging to a farmer in al-Mantara area of the town. He said that the settlers used a chainsaw to cut down several olive trees in the grove. Representatives of the Israeli military and the Civil Administration (CA) notified on Thursday the Palestinian inhabitants of Khan al-Ahmar, east of Jerusalem, that their only remaining option is to move to al-Jabal, a relocation site allocated to the community without consulting them next to the Adu Dis garbage dump, according to the Israeli B'Tselem human rights organization. The community’s lawyer, Shlomo Lecker, had expressly informed the Civil Administration officer in charge that he is not permitted to meet with his clients without his consent and presence – yet the CA went ahead regardless. 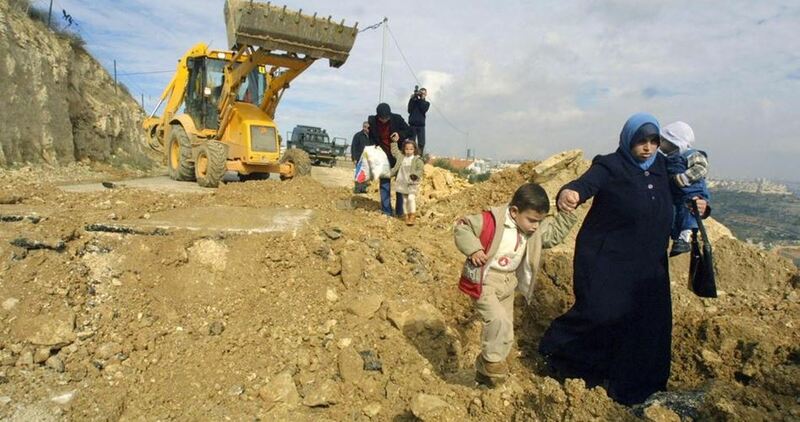 This came ahead of a High Court hearing scheduled for Monday, 25 September, on the community’s petitions against the Israeli plan to demolish all its structures and on a petition by settlements in the area of Ma’ale Adumim to demolish the Khan al-Ahmar school. The CA's actions appear to be paving the way for the Israeli government to claim that it is acting in good will and has consulted the community. Last week, B’Tselem sent an urgent letter to Israel’s prime minister and to other top government and military officials, cautioning that demolishing the Palestinian communities of Sussia and Khan al-Ahmar as planned would constitute a war crime for which they would bear personal liability. The forcible transfer of Khan al-Ahmar will enable future expansion of settlements, including in the area designated E1 – a plan being promoted in part by the settler lobby. On Sunday, 27 August, hundreds of settlers, joined by MKs Shuli Mualem and Moti Yogev (both of the Jewish Home party), demonstrated near the Khan al-Ahmar community, pressuring the government to move forward with its demolition plan.